Fine wine merchant IG Wines and La Compagnie Delicatessen, from the famous Experimental Group including Experimental Cocktail Club in London’s Chinatown, have teamed up to present a tasting of Old vs New World Wines. Held in the beautiful workshop and tasting room above La Compagnie Delicatessen, you will enjoy six wines of global status and cult following. Paul Hammond, wine expert and director of IG Wines, will be showcasing wines for an exclusive Ultra Vie wine tasting event, presenting a tantalizing tasting experience of Old World vs New World Wines. The tasting will explore some of the leading second wines from the world’s greatest estates, showcasing new world variations on old world established blends. You will explore different winemaking styles, techniques and grape varieties and asking the question can we distinguish the old world’s tell-tale minerality and harmony against the new world’s ripe fruit flavour profiles? Upon arrival you will be led to the workshop where you will enjoy a welcome drink whilst taking in the bustling atmosphere of London’s Seven Dials. 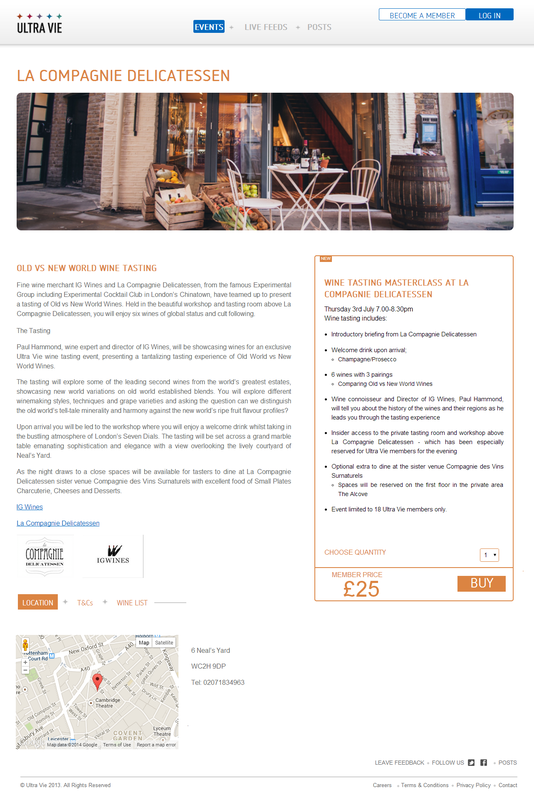 The tasting will be set across a grand marble table emanating sophistication and elegance with a view overlooking the lively courtyard of Neal’s Yard. As the night draws to a close spaces will be available for tasters to dine at La Compagnie Delicatessen sister venue Compagnie des Vins Surnaturels with excellent food of Small Plates Charcuterie, Cheeses and Desserts.